PDL is a standard of the Inernational Virtual Observatory Alliance for describing deploying and running scientific services and workflows [http://www.ivoa.net/documents/PDL/20140523/index.html]. 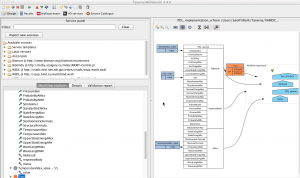 By using the PDL framework we exposed VAMDC as a PDL web service, accepting requests on radiative process. As for all the PDL services, the users can interact with the VAMDC-PDL one by using a standalone Java-Swing client or by using the Taverna Workflow Engine. 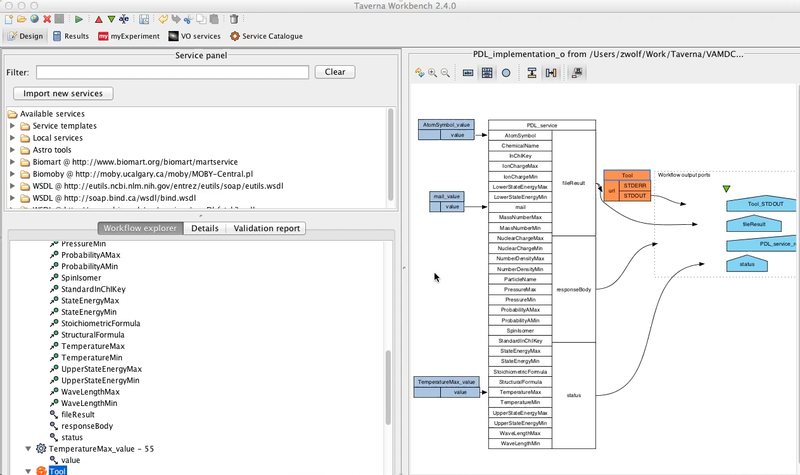 Using the Taverna Workflow Engine, the VAMDC-PDL service could be invoked as a part of a more complex workflow for processing, inter calibrating or comparing data. In the sample video, we use Taverna for submitting a query. Then Taverna invokes the standalone XSAMS Converter for processing the computed results. The result of this last step is automatically displayed by taverna into a web browser.